Interior #1.3, 2016, video still. Hmm, I’ m suddenly thinking of Suddenly Last Summer where Katherine Hepburn tries to persuade Montgomery Clift to lobotomise Elizabeth Taylor so that Liz will not reveal the sordid demise of Hepburn’s son Sebastian–he was torn apart (and partially eaten) by a ravenous gang of Spanish rent boys. The casting of Monty Clift is interesting. Founder of the ‘beautiful but terribly disturbed’ school of acting, it would seem that he fitted more the role of plat de jour for the crew of hungry hustlers than the sensible doctor type. But then he did play a young Sigmund in John Huston’s Freud: The Secret Passion (based on an original treatment by Jean-Paul Sartre!). Partially eaten by a ravenous gang of Spanish rent boys? Have you just made that up??? Situated between perception and consciousness, a voice is heard, as if from an adjacent room, rising.4A shaft of half-light fades, pierces, and such a long turning, an endless circle of square walls. Will you illuminate the choreography of this moment? I am so very sleepy now. Restlessness and (T)witchery. That zone of shades where we know nothing of ourselves. The stroke of the opening makes absence emerge: hungry, feral, stamping: remembering is gradually substituted for itself. This pulsation of the slit. Shadows. Where am I? There is only one method of knowing one is there, so you ask yourself where you are, what it is you are inside of, permeable to something analogous as light whose refraction changes from layer to layer. We cannot leave. This sliding away. We cannot refuse ourselves entry. J— (calm): We can understand that it is mysterious. That is itself an understanding. 1 Jacques Lacan, The Four Fundamental Concepts of Psychoanalysis, p.33. As with all of Lacan’s ‘séminaire’, lectures transcribed by Jacques-Alain Miller, quotes are not accompanied by references to specific texts or page numbers. 2 Sigmund Freud, The Unconscious, p. 58. 3 Lacan, ibid, p. 33. Lacan states of the unconscious itself, that ‘its status of being, which is so elusive, so unsubstantial, is given to the unconscious by the procedure of its discoverer’. I play fast and loose with this statement by upturning it to frame an idea of the film being brought into being through a dialogue with its screenplay: its precursive, and self-erasing text. 4 Lacan, ibid. From this point on, all phrases in italics are taken from the chapter ‘The Unconscious and Repetition’. Cocteau, Jean, La belle et la bête, 1946, France, 1 hour 33 minutes. Frensham, Ray, teach yourself screenwriting, London: Hodder & Stoughton Educational, 2003 [London: Hodder Headline, 1996]. Freud, Sigmund, The Unconscious, trans. Graham Frankland, (London: Penguin Books, 2005) [Das Unbewusste, in Internationale Zeitschrift für ärtzliche Psychoanalyse 3 (4), 2015]. Goffman, Erving, Frame Analysis: An Essay on the Organisation of Experience, (Lebanon, NH: Northeastern University Press, 1986) [New York: Harper and Row, 1974]. Hitchcock, Alfred, Spellbound, 1945, US, 1 hour 51 minutes. Lacan, Jaques, The Four Fundamental Concepts of Psychoanalysis: The Seminar of Jacques. Lacan, Book XI 1964, ed. by Jacques-Alain Miller, trans, by Alan Sheridan, (New York: Norton, 1998) [Le séminaire, Livre XI: Les quatre concepts fondamentaux de la psychanalyse, 1964, ed. by Jacques-Alain Miller Paris: Éditions du Seuil,1973]. Rancière, Jacques, The Intervals of Cinema, trans. by John Howe, (London: Verso, 2014) [Les écarts du cinéma, Paris: La fabrique éditions, 2011]. Romero, George A., Day of the Dead, 1985, US, 1 hour 40 minutes. 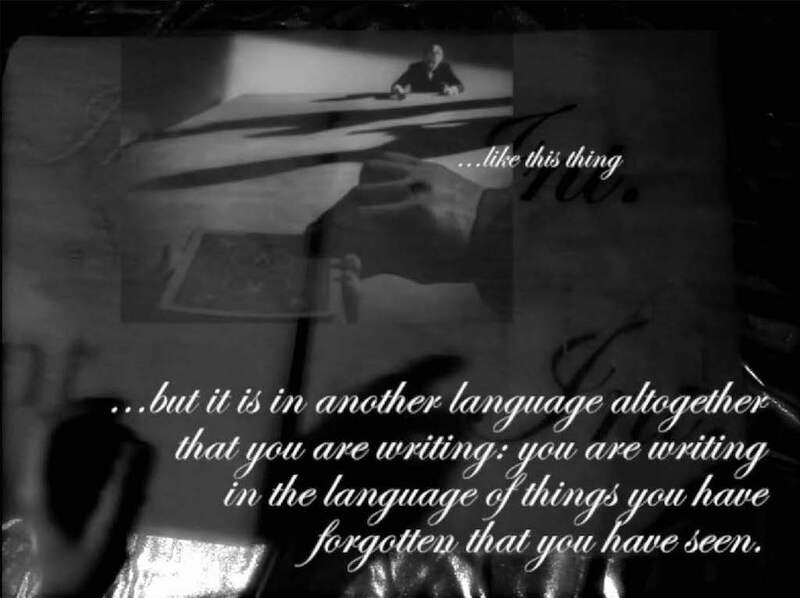 Emma Bolland is artist and writer with an interdisciplinary practice foregrounding auto-fictive art-writing, film, voice, drawing, reading as praxis and performance. Recent events and publications include a performance/intervention at the Moving Performances Symposium, University of Oxford, a solo exhibition at The Wild Pansy Project Space, University of Leeds (2016), the publication of Over in and Under, her creative translation of Freud’s Über Deckerinnerungen (with accompanying sound work / audio performance) in 3am Magazine (2015), and the publication of her single author pamphlet Lectolalia (2015) from Gordian Projects. She has books in the collections of the held in the collections of the V&A, The Saison Poetry Library at the Royal Festival Hall, and the Tate Britain Archive and Library. Her Ph.D. research title is Truth is Structured Like a Fiction: Auto-Fictive Practice and the Expanded Screenplay. She interrogates screenplay structure uncoupled from the endpoint of film, positioning its textual and spatial complexity as the framework for an interdisciplinary auto-fictive practice. The multi-voiced components (spatial and time-based) of scene, location, character, mood and action, dialogue, transitions, and viewpoints, produce the framework for method and strategy. Psychoanalytical concepts of the unconscious, memory, language, and the gaze, and aspects of frame analysis and communication theory relating to counterfactuals, reflexivity, staging, layering and performativity of discourse, underpin the work.